I finished Scot D. Ryersson and Michael Orlando Yaccarino's book Infinite Variety - The Life and Legend of the Marchesa Casatilast evening and, true to form, I've spent this morning furiously questing for additional imagery and information on the fascinating Marchesa and all of her far-reaching influences. Luisa Casati Stampa di Soncino, Marchesa di Roma is truly a non-pareil that could hardly be summed up here, but I did want to celebrate her miasmic life in art and fashion. I mentioned this book a few posts ago in the Lit Tag, but now that I've read the entire book I have to say that I'm really haunted. I cannot tell if I even like the Marchesa as a person, but I am completely enthralled by her ceaseless devotion to art and creativity - both in herself and others. So, the whole snakes and monkeys thing sort of creeped me out, but how shockingly fabulous would it be to wear a little coiled snake as a dramatic necklace at a dinner party? Or to walk a pet cheetah or alligator like they were the family Jack Russell? As the authors did state, the Marchesa's quest to always out-do herself got a bit stale over the years; her profligate lifestyle becoming almost insulting during political and economic crises, while her overbearing eccentricity hid an ever-growing personal insecurity. As a quote from Maurice Druon said in the book: "Eccentricity is tolerable only in its first freshness. Cherished until it has gone stale, it becomes unbearably pathetic and at the same time alarming." Eccentricities aside, the Marchesa did accomplish exactly what she set out to do: become a living work of art. Her personal style of medusa-like curls dyed bright red, large black-rimmed eyes, sleek gowns, and hats swathed in veils have influenced many fashion designers, writers, and film directors. Even toward the end of the Marchesa's life when she was forced to live in poverty, her tattered elegance recalls everyone from Dickens' Miss Havisham through to Big and Little Edie from Grey Gardens. While one cannot help but feel sorry for one of Europe's former glitterati in her late-life squalor, looking at the reach of her influence you can see this is not how she is remembered. La Marchesa Luisa Casati with a Grehound by Giovanni BoldiniFollowing-up on some of Luisa Casati's portraits, I learnt more about Augustus John and Giovanni Boldini, both of whom painted significant images of the enigmatic woman. In 2003, London's Royal Academy of Arts held an exhibition Pre-Raphaelite and Other Masters: The Andrew Lloyd Webber Collection, which included Boldini's 1908 portrait of the Marchesa with her Greyhound. Art historian Christopher Wood stated: "The staggering Boldini portrait of the legendary Marchesa Casati is surely the greatest portrait of the Belle Epoque." 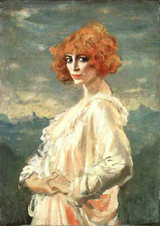 Augustus John's 1919 portrait is considered a twentieth-century masterpiece, and was purchased by the Art Gallery of Ontario in 1934, while the tripe-eye photograph of the Marchesa taken by Man Ray in her hotel suite at the Paris Ritz is considered the first and most important of Surrealist photographs. Even the Marchesa's famous ruin of a home in Venice, the Palazzo Venier dei Leoni on the Grand Canal, was purchased in 1949 by Peggy Guggenheim and now houses the prestigious Guggenheim Museum. Thought to be lost, another major portrait by Romaine Brooks has recently been recovered and is in a private collection. Hopefully an image will become available sometime soon! Having never seen any of Brooks' work, (now impossible to believe) I have enjoyed looking at her paintings, finding them incredibly odd, yet beautiful, and certainly very modern for their time. Likewise, the work of Giovanni Boldini is now among my favorites for its romantic yet impressionistic style. I've learnt that a handful of Boldini's pieces even reside in San Francisco! Her influence is not limited to art and fashion, however. Vosges Haut Chocolat created a special collection of Marchesa Truffles which are available only in December. "Black sea salt caramel ensconced in 85% bittersweet dark chocolate and real freshwater pearl dust." A very fitting tribute. My friend Michael Mattis wrote a piece about this book and La Casati on Dandyism.net a few years ago, wondering if the Marchesa could be considered "a dandy"; if she were a man then no doubt the term would apply, but as a woman? According to Mr. Mattis, even if the Marchesa were a dandy, being androgynous, masculine, and beautifully dressed as she was, she wasn't elegant enough for the term to apply. True, the Marchesa was heavy-handed with everything from eyeliner to pearls to gold lamé, but I would hold off on the dandy label anyway. To me, the Marchesa's androgyny and aggressive extravagances set off her distinct womanhood, I don't find her masculine at all. This, like Marlene Dietrich or an Yves Saint Laurent Smoking, make the true woman. The Marchesa's style was all about NOT being manly, but being every bit the independent, entitled woman that she was born to be in this world. As another fashion designer, Elsa Schiaparelli, stated about La Casati: "Tall and gaunt with heavily made-up eyes, she represented a past age of splendor when a few beautiful and wealthy women adopted an almost brutally individualistic way of living and presenting themselves to the public."